The subject of the debate is Bill O’Reilly’s belief, widely shared within the conservative bubble, that President Obama has offered no concessions on long-term spending cuts. This is factually untrue — Obama has offered a plan including more than a trillion dollars in reduced spending to a variety of programs, including Medicare and Social Security, as well as the reduced spending on interest payments. Obama’s budget also details his proposed cuts to scores of programs in an extensive 205-page document. But the lack of Obama spending cuts is a Fox News Fact, and as such, O’Reilly believes in it with unswerving devotion. He loudly and belligerently insists Obama “hasn’t even submitted any proposals” and “he just says, we want to raise taxes.” When Alan Colmes manages to interject that Obama has offered a proposal that has more spending cuts than tax increases, O’Reilly insists Obama’s offer is vague and begins insisting Obama has not mentioned any specific programs he wants to cut. O’Reilly: “I asked him four times, Colmes, to give me one specific program out of all the entire federal budget, $3.2 trillion worth of spending that Obama said he would cut, he cannot. … I asked Colmes for one, he can’t provide it. Can you? 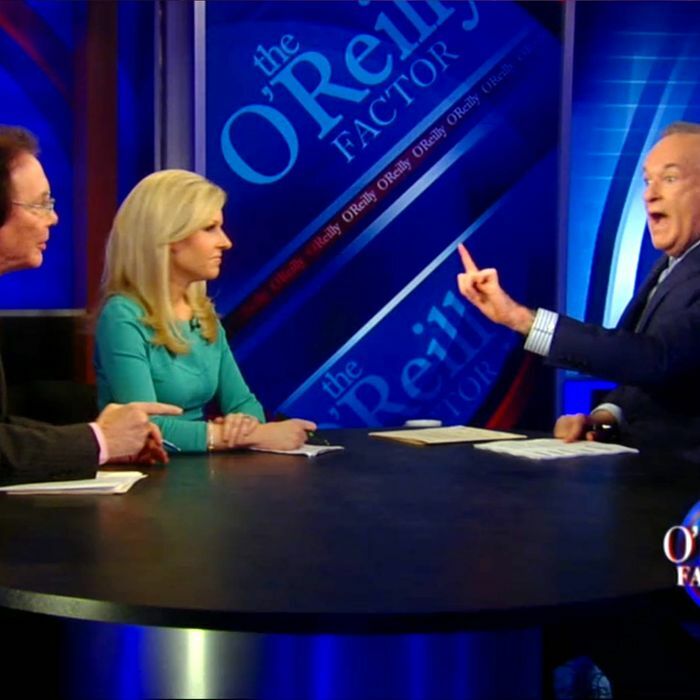 O’Reilly: “Okay. So both of our people, ladies and gentlemen, cannot provide one program out of $3.2 trillion in spending that this president said he would cut! Everyone here is playing their appointed role. Colmes is pleading with O’Reilly to stop yelling at him and whimpering things like “we’ll just have to disagree.” Crowley is affirming O’Reilly’s correctness and cheerfully allowing him to interrupt after a couple of seconds of talking so as not to yammer on in a way that annoys him. And O’Reilly himself, after finally calming down, reaffirms his own white-is-black claim with such conviction that viewers have probably already forgotten that he is feverishly denying something that they witnessed with their own eyes. The segment has achieved such Fox News perfection that it can never be reached again. Roger Ailes should simply loop it endlessly for the rest of time.